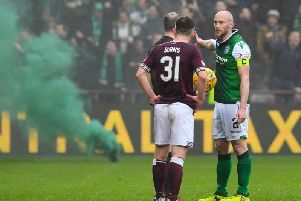 A few comments from supporters after Hibs picked up all three points from their trip to Paisley where Eddie May and Grant Murray were in charge. @JohnThomson: "Such a big win given the week we’ve had! Get in there Hibs." @GISALEGEND: "Made hard work of it in the end I felt as behind for so long, but win is a win. Just need to go a run again & get everything sorted within the club and focus on next season I suppose now." @paulp79: "Who’d have thought at half time well done Hibs." @peef14: "Well done the Hibbies, now get the issue with Lennon sorted before he goes west in the summer!" @CToghill: "Amazing what two up front can do, cracking grit second half lads onwards and upwards." @Cscott5: "Miles better second half. Still lots of improvement needed. But the win was all that mattered today." @Scott28426193: "Lennon out on Friday, Hibs win first league game in 6 on Sunday. If Carlsberg did weekends...."
@discoedinburgh: "Now sort the mess out behind the scenes so we can move forward." @JordanScott17: "Great 2nd half and big 3 points , Shaw coming on made the difference with a change of shape and 2 strikers on , Mallan superb today and Marciano with 2 outstanding saves which effectively are match winning with the score at 1-2 , finally some positives." elevengoats: "Thought Gray was outstanding today. We missed him so much!" Dunfyhibee: "Simply has to play, drives us forward and sets the tone. A real captains performance." GreenNWhiteArmy: "Davy Gray needs to be starting when he's fit. Doesn't matter if it's against Hearts, St Mirren or Molde. We look A FAR better team and much more dangerous with him in it as an out ball on the right hand side. And he's a warrior." hibeegirl: "One good thing to come out of all this Lennon nonsense is that Gray might now be offered a new contract." RossScott1991: "Anyone else notice especially after Daz goal all the players celebrating together and infront of the fans. Thought was great and refreshing to see. I love when teams celebrate together, it was a united front I thought by the team."